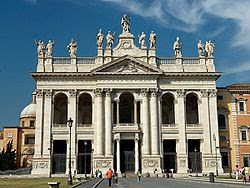 Feast of Saint Andrew, Apostle: "How beautiful are the feet of those who bring the good news!" 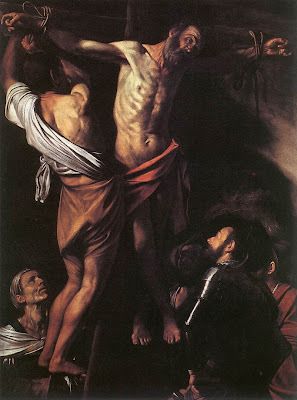 Art: Caravaggio, The Crucifixion of Saint Andrew. Tuesday, Advent 1: "The Spirit of the LORD shall rest upon him"
:a Spirit of wisdom and of understanding,A Spirit of counsel and of strength,a Spirit of knowledge and of fear of the LORD,and his delight shall be the fear of the LORD. Monday, Advent 1: "Lord, I am not worthy to have you enter under my roof"
... only say the word and my servant will be healed. 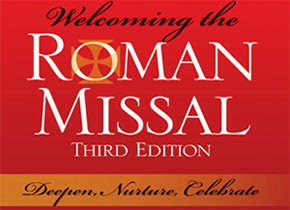 We must all be very watchful, both the congregation of their misalettes or pew cards and the priest his Missal, so that we can launch this new English translation in a serene and prayerful manner. But if we should make a mistake we certainly do not draw attention to it or ourselves by reacting but, rather, continue with devotion to participate in the flow of the liturgy, being present to what is taking place. In this way we will grow with practice and patience to internalize the beauty of the liturgy which comes to us through this new English translation so that our spiritual lives of Faith may always benefit. It is very appropriate that we begin this new "page" as it were in the liturgical life of our beloved Church at the same time that the Church launches a new year in the life of faith with Advent. Both work together to help us become more vigilant, more watchful in Faith for the Lord and his "coming", which is what the word Advent means. It is authentic Faith which rouses us to be alert through prayer in love for the Lord. The gift of a beautiful new translation for the prayers of holy Mass enables us to better keep our loving watch in a Faith both energetic and profound. Because these new prayers are more faithful both to the Scriptural foundations of holy Mass as well as to the entire liturgical tradition handed down in the Holy Spirit from Christ through the Apostles we can confidently entrust ourselves to a wholehearted acceptance of the gift. "This tireless fervor can come only from love." Let us turn always anew to the beautiful prayer of holy Mass with hearts alert in Faith evident through a tireless readiness for God and His love. When we accept the Lord with love as He comes to us anew each time through the Church, in the Word and Sacrament of the liturgy of holy Mass and in a life marked by the rhythms of prayer, we are able then to return ourselves to God in life and love. 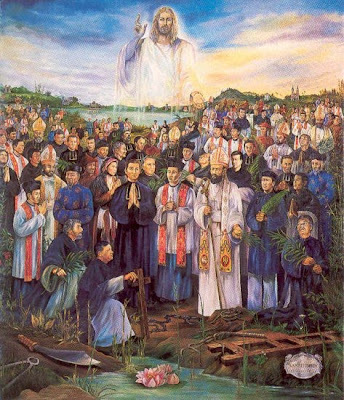 St. Andrew Dung Lac and the Martyrs of Vietnam: “You will be hated by all"
Image source: Wikipedia. For more on the Vietnamese Martyrs, click here. "Occupy" the Kingdom! 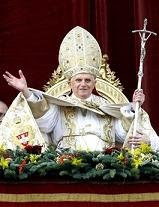 The King is a Shepherd who promises and delivers food, clothing and shelter. Forever. "Are you gonna feed my kids?" This is the reply of a woman recently invited to join the "occupiers" who we see camped out in major cities all over our country in exercise of free speech to demand more money. We think. There seems to be more confusion about these roughly organized groups than anything else. In their joblessness, inactivity and helplessness these occupiers are more like lost and scattered sheep, without a shepherd, unable to promise anything to anyone else let alone do anything for themselves. Whether it is a job, money, food or shelter, we humans seeks these things as a good for today and, perhaps even more so, as a promise of life for tomorrow. "Thus says the Lord GOD: I myself will look after and tend my sheep." God makes a promise in the first reading that He himself must be the one to shepherd humanity: "shepherding them rightly" with disinterest, justly, that is with love. How will God do this? Wherever humanity is lost, strayed, injured or sick He Himself must be the one to attend to their needs if they are to have life today and hope for tomorrow. In the Gospel reading the Divine Word interprets Ezekiel rightly, the prophecy being fulfilled in Jesus Christ. How, you ask, will God Himself shepherd the sheep? How can we hope to be found, to have our wrongs righted, be healed, made whole? The answer to this question is found in you and in me. Through the grace of our Baptism we have been incorporated into the "royal family" of God. We have inherited heaven and with it a share in the work of Christ which continues now in the world. in prison and you visited me.'" Jesus Christ is the King of the Universe. His kingdom becomes a tangible experience for all mankind when His Body, the Church on earth, fulfills His mandate to feed, give drink to, embrace, clothe, care for and visit any brother or sister in need. The Kingdom remains closed to those who cannot live in Faith, see with the eyes of Faith, know God through Faith. "The kingdom of God [is] righteousness and peace and joy in the Holy Spirit." The end-time in which we live is the age of the outpouring of the Spirit. Ever since Pentecost, a decisive battle has been joined between "the flesh" and the Spirit. The power of God's Kingdom is found in the grace of seeing Christ in every human person and responding to the vision of faith. The king identifies Himself with those who seem in a superficial point of view to be the most distant from a kingly court, a royal palace: with the poorest of the poor. Only God can promise food, clothing and shelter. Forever. These are the food of His Eucharist, the clothing of grace and the shelter of the place in heaven He has prepared for us. "Occupy" the Kingdom by receiving the Eucharist as a member of His Body the Church and live His life now through service of others. Saturday 33: "the dead will rise"
How can some of you say that there is no resurrection of the dead? But if there is no resurrection of the dead, then Christ has not been raised; if Christ has not been raised, then our preaching is in vain and your faith is in vain. . . . But in fact Christ has been raised from the dead, the first fruits of those who have fallen asleep. St. Elizabeth of Hungary: "today I must stay at your house"
“Today salvation has come to this house ... For the Son of Man has come to seek and to save what was lost." Beginning with Mary's unique cooperation with the working of the Holy Spirit, the Churches developed their prayer to the holy Mother of God, centering it on the person of Christ manifested in his mysteries. In countless hymns and antiphons expressing this prayer, two movements usually alternate with one another: the first "magnifies" the Lord for the "great things" he did for his lowly servant and through her for all human beings the second entrusts the supplications and praises of the children of God to the Mother of Jesus, because she now knows the humanity which, in her, the Son of God espoused. Tuesday 33: "today I must stay at your house." Mon 33: "What do you want"
"Lord, please let me see." "I want to see God" expresses the true desire of man. Thirst for God is quenched by the water of eternal life (cf. Jn 4:14). We expect to be nourished and cared for by persons in positions of leadership and "trust" but, tragically, in the mystery of iniquity in the world this is not always so. Recent events within a university sports program remind us of the need to all be vigilant for the sake of protecting God's precious gift of our children and young people. We all frankly acknowledge that trust has been breached by individuals within the Church as well. Failure to protect the most vulnerable persons among us, beginning with the unborn child in the womb, is a sin against the most precious possession which God entrusts to us on the natural level: the only creature He has made in His own image and likeness. All of us are called to be a leaven of a new society in which everyone cares for all of his brothers and sisters without exception from the newly conceived child in the womb to the most elderly of persons. Our children must be educated from a young age to be comfortable saying they are uncomfortable. We must be willing to listen to anything they have to say so that no child will ever be harmed again. The Church is placed in the world with God's authority, called to be that "worthy wife" of infinite value because charged with the task of the infinite gift of the world's salvation. How great is the responsibility that all of us share in the Church to protect all human persons and to call them to salvation? The Church is espoused to God as a wife is bonded through love to her husband. That we may be nourished in saving love, God has left His Bride the Church, the Spouse of Christ, in which we may grow and thrive. For these reasons the Church is also our Mother in the life of grace. Through all the gifts of the Church, and in particular the sacraments, He treats us gently as His children with tenderness befitting one who cares for the very smallest needs of those for whom He is responsible. The journey is the distance we experience between God and us. It is also the time which elapses between the Son's return to the right hand of the Father, where He intercedes for us, and our own journey there. In the face of the most daunting evil of sin, God accompanies us on our path through the life of grace in the Church. Above all this is true of the Eucharist, the very Body of His Son. The Body of Christ, His Son, is the Father’s dearest possession. Will you, will I, use our talents, God’s grace, that we may truly grow in faith, hope and love? Will we protect the natural gift of life of every human person, beginning with the youngest and most vulnerable persons? In this way the call of God to salvation in Christ is prepared and anticipated. The Church is our Mother and leads us to salvation, above all as we worship together on the Lord's Day. 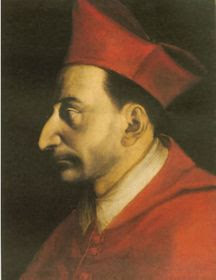 We are called to flourish in joyfully receiving through the Church the most precious gift of the Father, especially in the Eucharist, the very Body and Blood, truly present, of His dearly beloved Son, for forgiveness of sins so as His children we may inherit holiness, and for life eternal, so we may enter into His heavenly dwelling when the Church on Earth is no more at the end of the world. Saint Josaphat: “The coming of the Kingdom of God cannot be observed." 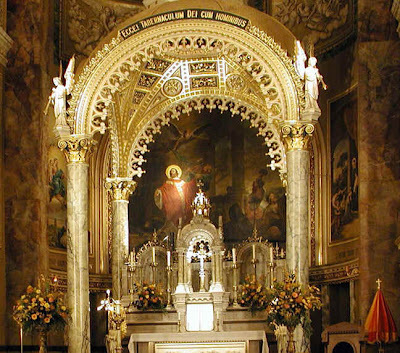 Image: Main altar, Saint Josaphat Basilica, Milwaukee. “... a glorious mantle instead of a listless spirit." Art: The Division of the Cloak, Simone Martini, 1312-17, Cappella di San Martino, Lower Church, San Francesco, Assisi. 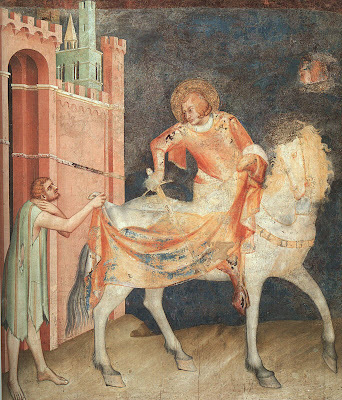 For more on Saint Martin, visit In Illo Tempore here. Jesus venerated the Temple by going up to it for the Jewish feasts of pilgrimage, and with a jealous love he loved this dwelling of God among men. The Temple prefigures his own mystery. When he announces its destruction, it is as a manifestation of his own execution and of the entry into a new age in the history of salvation, when his Body would be the definitive Temple. Christ is the true temple of God, "the place where his glory dwells"; by the grace of God, Christians also become the temples of the Holy Spirit, living stones out of which the Church is built. Tuesday 32: "the souls of the just are in the hand of God"
Monday 32: "If your brother sins, rebuke him"
Filial respect is shown by true docility and obedience. "My son, keep your father's commandment, and forsake not your mother's teaching. . . . When you walk, they will lead you; when you lie down, they will watch over you; and when you awake, they will talk with you." 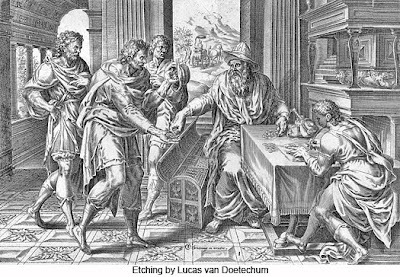 "A wise son hears his father's instruction, but a scoffer does not listen to rebuke." The French say, "le silence est doux et fort à la fois", silence is at once sweet and strong. In the world the many sources of noise sometimes combine into an overwhelming din and we can easily forget that we crave the medicine and beauty of silence. In fact, our liturgy of holy Mass incorporates silence in two places: after the homily and following Communion. In these two instances we need the room silence gives to fully receive and digest the Word which comes to us through proclamation of the sacred Scriptures and through the Body and Blood of the Lord really and truly present in the Eucharist. But silence can equal consent not only to good, to God Himself, but also to evil. Many and competing voices today are clamoring for our attention and that of our children. These voices reach us through cell phones with their text, internet and voice capacity, through social media like Facebook and, of course, the old fashioned way: person to person. Our children are exposed with increasing intensity and frequency to dissonant voices which conflict with the truths we hold as Catholic Christians. Only the truth will set us free. The truths which have been handed down through the Holy Spirit in the Church are necessary for our flourishing as human beings in this world and our eternal happiness in the next because grace builds on nature. There is waiting in the life of every human person. And waiting for a person we love is perhaps the most difficult waiting that we must do. The virgins in the Gospel are a sign both of the small ways in which we all experience expectation in this life as, every day, we are wait at the "door of the future" and that this life itself is the anteroom of eternity and the coming of Jesus Christ. In the waiting of every human person is needed the strength of all the virtues, including chastity, which is symbolized by the virgins who play a role in the celebration of the wedding feast in much the same way bridesmaids do today in our wedding ceremonies. Sometimes members of the wedding party wait at the church truly ignorant of "the day or the hour" as the bride makes her own way, at her own pace, to the celebration! More seriously, however, among the many gifts needed for patient expectation is the waiting of chastity, a moral good which obliges those of us who look forward to salvation in the kingdom of God. Sometimes spouses wait in marital chastity for their husband or wife to return from a journey or military deployment, young engaged couples, through the chastity of abstinence, wait for marriage, celibate priests, and men and women religious, through their celibate chastity wait for the kingdom of God in all its fullness. Our children must be formed in such a way that they too will one day also be able to accept the grace of chastity as a free and mature Christian adults. Many forces in the world today have declared war on the innocence of our children which longstanding wisdom teaches should be extended as long as possible, and which is a different journey for every human person. For these and more reasons, the societal push toward classroom education in matters of marital intimacy violates the latency period and with its physiological nature violates the different developmental stage of each child. But we are necessary for this process. If we remain silent in the face of the onslaughts upon our children's moral and faith integrity we leave them weakened before their enemies and also bereft of the power of our witness. Parents in particular have the irreplaceable role of serving as the first teachers on their children in the ways of faith. The Church teaches and supports parents in the primary role as educators of their own children. Many Catholics, and even moreso the vulnerable young, fasten very quickly upon the opinions and attitudes available principally through the internet and television, in many cases without any reference whatsover to Catholic truth. This is seen especially with matters of marital teaching and of the bodily expression of love proper to the sacrament of matrimony. As we live the chastity proper to our vocations and experience the joy of cooperating with grace in this way, using the sacraments properly as needed to keep us on this path, we are prepared most powerfully to hand on this way of Christian living and joy to our children as they seek God's will in discerning their own vocations which await them beyond the door separating today from the future. Our silence can leave our children victim to the cruel winds of every opinion or error that blows in the world today. Let us speak out with the voice of Christ in His Church that our children will be formed firmly in the wisdom of the truth of God. Chastity is wisdom in action through the holy use of God's gifts for love and life. We prepare through all the virtues to "stay awake" as commanded by the Lord in the Gospel: "stay awake, for you know neither the day nor the hour." Living the life of the kingdom here and now gives us the joy of anticipating the moment we are called to enter into its fullness, into the "joy of the Lord". Saturday 31: "You justify yourselves"
Justification detaches man from sin which contradicts the love of God, and purifies his heart of sin. Justification follows upon God's merciful initiative of offering forgiveness. It reconciles man with God. It frees from the enslavement to sin, and it heals. The Church prays that no one should be lost: "Lord, let me never be parted from you." If it is true that no one can save himself, it is also true that God "desires all men to be saved" (1 Tim 2:4), and that for him "all things are possible" (Mt 19:26). Saint Martin de Porres: "this I seek: To dwell in the house of the LORD"
The mission of Christ and the Holy Spirit is brought to completion in the Church, which is the Body of Christ and the Temple of the Holy Spirit. This joint mission henceforth brings Christ's faithful to share in his communion with the Father in the Holy Spirit. The Spirit prepares men and goes out to them with his grace, in order to draw them to Christ. The Spirit manifests the risen Lord to them, recalls his word to them and opens their minds to the understanding of his Death and Resurrection. He makes present the mystery of Christ, supremely in the Eucharist, in order to reconcile them, to bring them into communion with God, that they may "bear much fruit."